I’m guessing I’ve been too positive in my approach to life recently. Either that, or too complacent. Life has seen fit to give me a partially dislocated wrist. Partially dislocated? Something’s either dislocated or it’s not, isn’t it? Well, not really. The technical name is “subluxation”. If you’ve ever had a joint pop out, then immediately pop back into place without the need for external pressure to put it back (like a doctor…or a wall), you’ve had a subluxation. Specifically, my subluxation is at the ulnar-carpal joint and it subluxes medially. Subluxations typically happen when the dislocating force (pressure, torque, etc.) on the joint just slightly exceeds the stabilizing pressures of ligaments, tendons, and muscles. When the dislocating force abates, even slightly, the stabilizing pressures snap the joint back into place. Unfortunately, my particular subluxation is not a one-time thing, it’s repeatable. It happens every time I flex (i.e. palmar flex) my wrist under load. This indicates that there is an unfortunate amount of permanent ligament stretch. Usually the way to rehabilitate this kind of thing is to strengthen the muscles overlaying the ligaments. There is a problem, however. I’ve looked in two anatomical atlases and an athletic training reference text. There are no muscles that directly overlay the distal head of the ulna. The flexor carpi ulnaris and extensor carpi ulnaris travel down the outside (medial) of the ulna, but wrap to palmar or dorsal side respectively about an inch or so before reaching the distal head of the ulna. No doubt this is why the subluxation is happening medially…there is no support structure other than the ligaments. 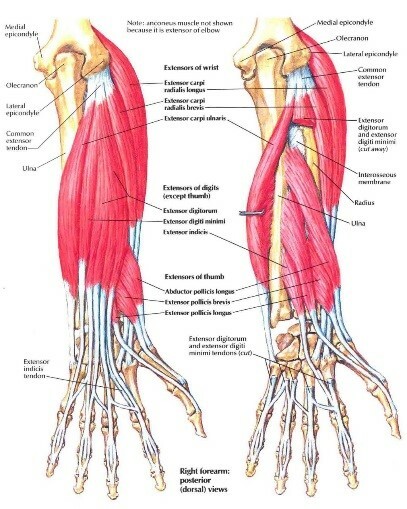 I can still strengthen the flexor- and extensor carpi ulnaris and hope that I can strengthen them to the point where they can hold the distal ulnar head in place via a third class lever type action. In the meantime, I’m finding that I have some pain in the radial side of the wrist as the radius tries to compensate for an unstable ulna. Gotta love chain reactions. From what I remember when I had a slight separation of the AC joint in my right shoulder, it took about 6 weeks for things to heal and settle into place. Granted there are different causal mechanisms at work, I’ll still use that as my baseline. At the moment, my plan is to keep my left wrist as immobile as possible (without a cast) for a few weeks. Ligaments don’t have a whole lot of healing capabilities, but they do have some. I’ll let them heal as much as they can, then start strengthening the ulnaris muscles. What’s orange and good for you? What about all the sugar? Yes. Oranges are carb heavy…the good thing is that the carbs are quickly metabolized and used. This means they don’t stay around in the system, providing a quick boost without the same kind of risk of weight gain from most sports drinks. The glycemic load of a serving of orange is also 1/3 that of a serving of banana. Don’t forget the fiber that comes with all fruits and vegetables. Not as much as celery, but a respectable 17% of daily value (assuming 2,000 calories daily). Oranges are a good fruit to have on your healthy eating list. After a workout, the high water content of an orange is very welcome. Not only does it help with being thirsty, it helps with faster uptake of nutrients than solid food.